@Arek817: jest o tym jakiś artykuł? "On the third day of the trial I witnessed, by chance, an episode which, apparently, no one else noticed and which gave me an impression of Hess's condition. I was sitting in the courtroom at the American Prosecution table while Ralph Albrecht was delivering his lecture on German governmental structure. It was my first opportunity to scrutinize the defendants and their counsel at leisure and close range. I was not paying close attention to Albrecht's presentation, but I heard him say that Hitler's "successor-designate was first the Defendant Hess and subsequently the Defendant Goering." This I well knew to be in error. The names were right but the order was wrong; Goering was number two and Hess number three. Since I was sitting barely twenty feet from those two gentlemen, I looked to see whether either of them had noticed the slip and, if so, how he reacted. Goering was already waving his arms to attract attention, pointing to himself, and saying repeatedly: "Ich war der Zweite!" ("I was the second!") As these protests were pouring out of Goering, Hess turned and looked at him and burst into laughter. It appeared to me that Hess also knew that Albrecht had misspoken (Albrecht corrected the order of succession at the end of his presentation), and was vastly amused by Goering's characteristically vain reaction. I inferred from this occurrence that Hess's amnesia was not as complete as he had given out." 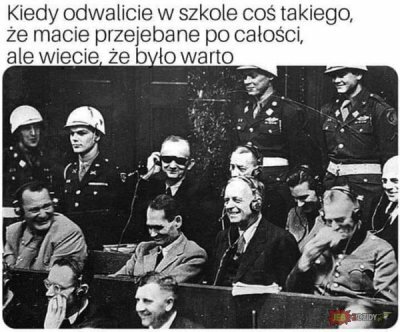 @wpgg: rozejrzałem się chwilę, znalazłem niewiele: wpis na reddicie, też niewiele mówiący, a także jakiś zbiór informacji "Contents of The Nuremberg Trials Collection", przez który się jednak nie przekopywałem. A lot of high ranking party members were of the opinion that the Nuremberg trials were essentially kangaroo court trials, and many of them did not take the process seriously, in light of many of the accusations levelled against themselves, without any sort of evidence at all. 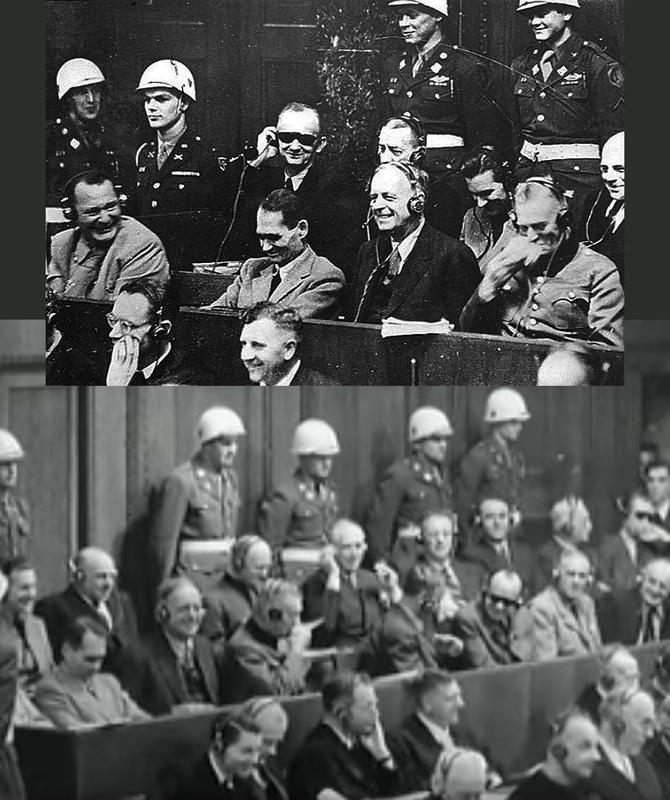 The Nuremberg trials were different to normal trials, instead of innocent until proven guilty, all men were deemed instantly guilty without evidence, and were required to prove their innocence at the trial, despite the fact they were bein detained. Many of them, especially Hess and Goring, thought the trials were a complete joke given what they knew happened, and what was being told to them that they did. This is one of the reasons why Goring killed himself, he pointed out all the factual inaccuracies in many of the statements, yet everything he said was disregarded, (as if they had already made their minds up and were speeding up the judicial sentencing process to kill as many high ranking NSDAP members that would not co-operate by changing their stories them as possible) then he ate a cyanide capsule in his cell before the trial was over. That photo is them having a laugh with the judge and judicial staff as their statements were being translated. OP odsyła do tego linku, ale na ten subreddit trzeba mieć zaproszenie. Gdybyś znalazł coś więcej, to zawołaj. Sam się mocno zainteresowałem tematem. @Racconz wiadomo z czego oni się tam wtedy śmiali?